Students in Mark Seigers’ iDesign STEAM class started last fall with bbig plans for a new product they will design, manufacture, market and sell this year. They just didn’t know for the first three months what that product would be. class—the most advanced of the several STEAM classes Seigers teaches at all grade levels—is to identify, produce, market, and sell an original product through the entire academic year. GMU District Superintendent Annette Hammond likes the direction the new STEAM program is taking. “It’s so important for our students to have exposure to the practical applications of everything they are learning in science, technology, math, business, and the arts,” she said. “To see them apply what they’ve learned as part of a team is a great thing. Mark does a great job of building their interest in collaboration across all these disciplines. In keeping with the international STEAM program philosophy, Seigers is working with iinterested students of all ages to create a ‘makerspace’, defined as a collaborative work space for making, learning, exploring and sharing that uses high-tech to no-tech tools. The STEAM classroom includes 3D printers and state-of-the-art software and resources that challenge them. For the iDesign class, the challenge is real. By early December, the team had considered and discarded several dozen product types, from cell phone covers to a long list of other accessories that might be attractive to potential buyers. Eventually, the team decided to center its interest on marketing to Generation Z, said General Manager Maya Farwell. There was good reason: Generation Z, which includes people born after 1995, now accounts for about a quarter of the U.S. population—more than ‘baby boomers’ (born between 1946 and 1960) or ‘millennials’, the group that reached young adulthood around the year 2000. Seigers helped the team make a list of their skill sets and kept them focused on choosing a product that matched those skills. In the end, the team chose a product they could easily produce within their $300 overall budget for production and marketing: bath bombs. The fizzy bathtub spheres often contain essential oils and other fragrances that help the bather relax and rejuvenate. The team is confident that student and other community members will buy them. Marketing staffers Morgan Keuhn and Skye Wilson said the plan is to produce a variety of colors and scents, from a natural healing line to a men’s version that will feature more masculine smells. The team’s schedule calls for the first rough products in early February with sales to begin in April. The price will be around $5, and of course, they want to turn a profit as part of the exercise. 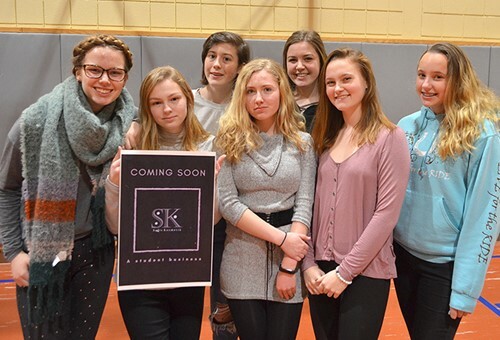 They will market their bath bombs under the brand name Sulis Kosmetik, using a logo designed by the team’s artist, Alivia “Libby” Retz. Sulis was a Celtic goddess worshipped in the thermal pools of Bath, England; Kosmetik is the German word for cosmetics. Retz designed a logo that is both simple and sophisticated. Posters of the logo went up in December, and they have created a buzz in the school among students who are eager to know more.